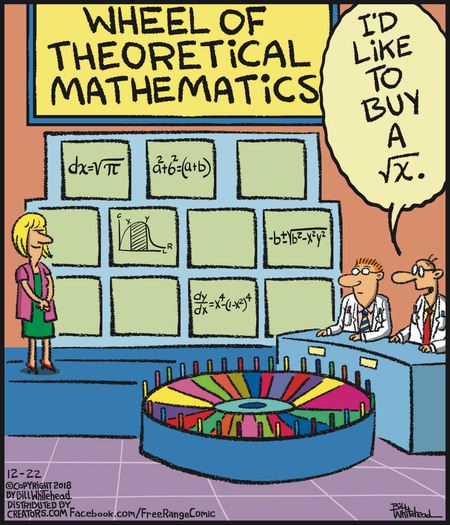 For this, the second of my Reading the Comics postings with all the comics images included, I’ve found reason to share some old and traditional mathematicians’ jokes. I’m not sure how this happened, but sometimes it just does. Zach Weinersmith’s Saturday Morning Breakfast Cereal for the 18th of March, 2018. Temperature’s a great subject though, and I’ve been thinking for ages about doing a series on it just because I want to explain negative temperatures Kelvin. One big field of mathematics is model-building. When doing that you have to think about the thing you model. It’s hard. You have to throw away all the complicating stuff that makes your questions too hard to answer. But you can’t throw away all the complicating stuff or you have a boring question to answer. Depending on what kinds of things you want to know, you’ll need different models. For example, for some atmosphere problems you’ll do fine if you assume the air has no viscosity. For others that’s a stupid assumption. For some you can ignore that the planet rotates and is heated on one side by the sun. For some you don’t dare do that. And so on. The simplifications you can make aren’t always obvious. Sometimes you can ignore big stuff; a satellite’s orbit, for example, can be treated well by pretending that the whole universe except for the Earth doesn’t exist. Depends what you’re looking for. 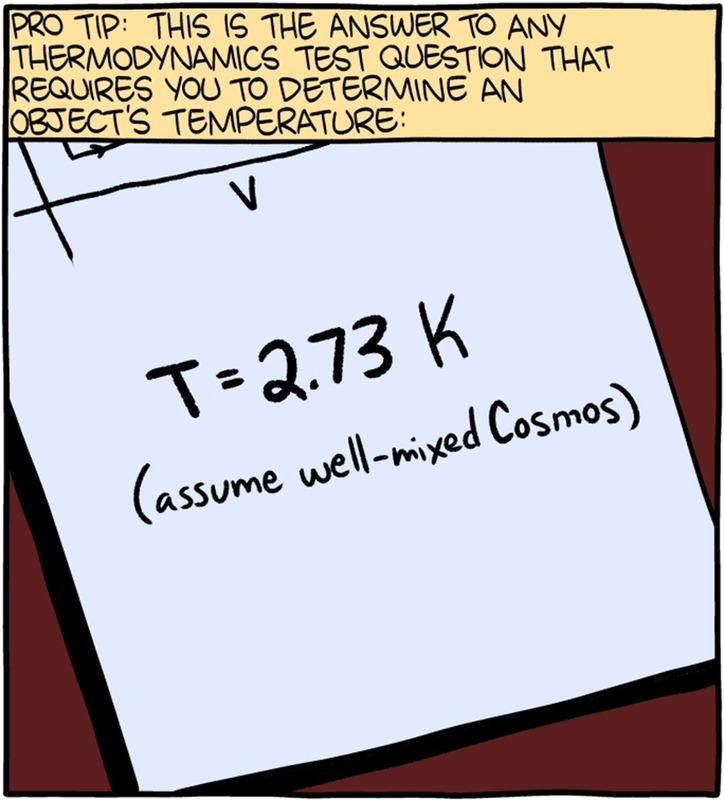 If the universe were homogenous enough, it would all be at the same temperature. Is that useful to your question? That’s the trick. Mark Anderson’s Andertoons for the 20th of March, 2018. Okay, but why the poster with the octopus on it? Mark Anderson’s Andertoons for the 20th is the Mark Anderson’s Andertoons for this essay. 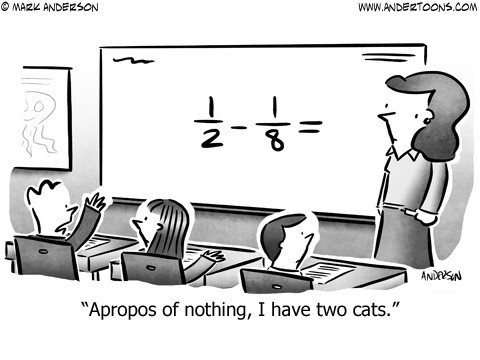 It’s just a student trying to distract the issue from fractions. I suppose mathematics was chosen for the blackboard problem because if it were, say, a history or an English or a science question someone would think that was part of the joke and be misled. Fractions, though, those have the signifier of “the thing we’d rather not talk about”. Daniel Beyer’s Long Story Short for the 21st of March, 2018. Not to nitpick but shouldn’t it be 1½ ± ½? Harley Schwadron’s 9 to 5 for the 21st of March, 2018. 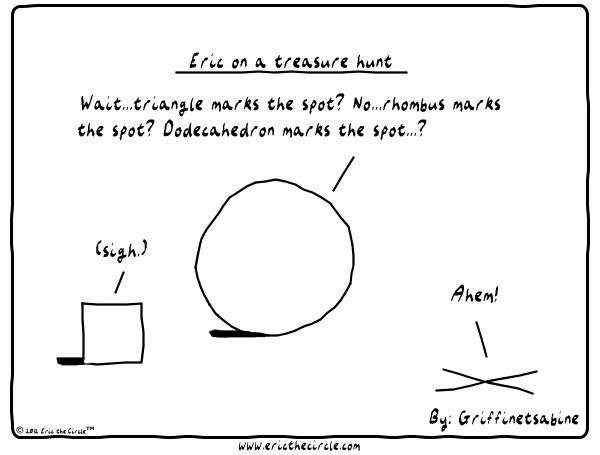 I understand the tie has to face the audience to make the joke work, but isn’t it more fun to imagine that it’s actually a pyramidal tie, like, a solid triangular projection of tie material, and we see one side of it and maybe there’s another equation written on the other side? Please vote in the comments. Harley Schwadron’s 9 to 5 for the 21st is a name-drop of Einstein’s famous equation as a power tie. 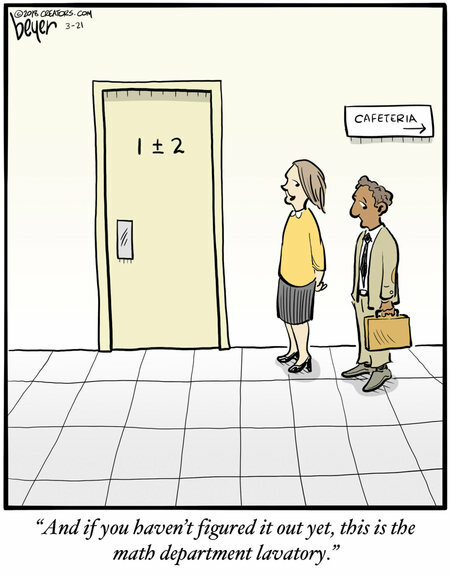 I must agree this meets the literal specification of a power tie since, you know, c2 is in it. Probably something more explicitly about powers wouldn’t communicate as well. Possibly Fermat’s Last Theorem, although I’m not sure that would fit and be legible on the tie as drawn. Mark Pett’s Lucky Cow for the 21st of March, 2018. I preferred Ding Dongs eater myself. But my heart was with the Suzy Q’s, if we’re not letting Tastykake into the discussion. Mark Pett’s Lucky Cow rerun for the 21st has the generally inept Neil work out a geometry problem in his head. The challenge is having a good intuitive model for what the relationship between the shapes should be. I’m relieved to say that Neil is correct, to the number of decimal places given. I’m relieved because I’ve spent embarrassingly long at this. My trouble was missing, twice over, that the question gave diameters instead of radiuses. Pfaugh. Saving me was just getting answers that were clearly crazy, including at one point 21 1/3. Zach Weinersmith, Chris Jones and James Ashby’s Snowflakes for the 21st of March, 2018. I would like to give you more context for this but I confess I haven’t been able to follow the storyline. I don’t know why but this is one of the strips I don’t get the flow of. Wulff and Morgenthaler’s WuMo for the 21st of March, 2018. Fun fact: since 68 is a rational number, the cosine of 68 has to be transcendental. All right, but it’s fun to me and whose blog is this? Thank you. But the cosine of any rational number other than zero is transcendental. Ditto the sine and the tangent. Wulff and Morgenthaler’s WuMo for the 21st uses excessively complicated mathematics stuff as a way to signify intelligence. Also to name-drop Massachusetts Institute of Technology as a signifier of intelligence. (My grad school was Rensselaer Polytechnic Institute, which would totally be MIT’s rival school if we had enough self-esteem to stand up to MIT. Well, on a good day we can say snarky stuff about the Rochester Institute of Technology if we don’t think they’re listening.) Putting the “Sigma” in makes the problem literally nonsense, since “Sigma” doesn’t signify any particular number. The rest are particular numbers, though. π/2 times 4 is just 2π, a bit more than 6.28. That’s a weird number of apples to have but it’s perfectly legitimate a number. The square root of the cosine of 68 … ugh. Well, assuming this is 68 as in radians I don’t have any real idea what that would be either. If this is 68 degrees, then I do know, actually; the cosine of 68 degrees is a little smaller than ½. But mathematicians are trained to suspect degrees in trig functions, going instead for radians.